Rolex Yacht-Master ladies steel platinum watches feature a case size 29mm and platinum bezels with stainless steel Oyster bracelets. We think you’ll agree, these watches are beautiful on the wrist. Also, BeckerTime offers a 30-day money-back guarantee and a Lifetime TradeUp Guarantee. In fact, we strive to deliver 100% customer satisfaction. So, let us help you find that perfect style. Please contact us if we can assist you. You know what I love? Matching his and hers watches. Especially Rolex watches. They’re similar in concept to engagement and wedding rings, but for Rolex watch enthusiasts!  And there’s no better pairing than the Rolesium stainless steel and platinum Rolex Yacht-Master for him and her—especially if you like luxury sports watches. 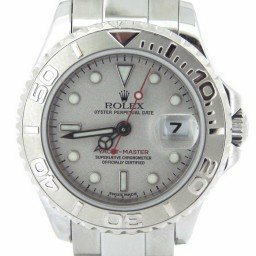 So if you are the lucky owner of a men’s Rolesium Yacht-Master, then you should definitely look at getting your lady a stainless steel and platinum ladies’ Yacht-Master to match. 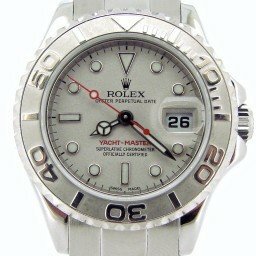 While both versions of the Rolesium Yacht-Master are similar in design, the Rolex Yacht-Master ladies steel platinum, ref. 169622 has a few notable differences. The first and most obvious difference is the size. The ladies stainless steel and platinum Yacht-Master sports a 29mm Oyster case—substantially smaller than the mens 40mm size. However, the construction is similar to the mens watch. 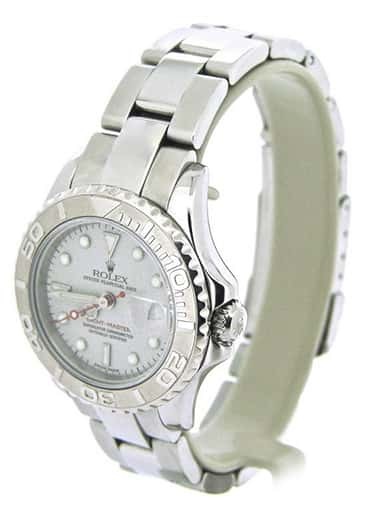 For instance, the stainless steel Oyster case includes a platinum bidirectional bezel. The bezel on the Yacht-Master ref. 169622 is especially attractive thanks to the contrast between the sandblasted platinum background and the polished platinum raised numerals. 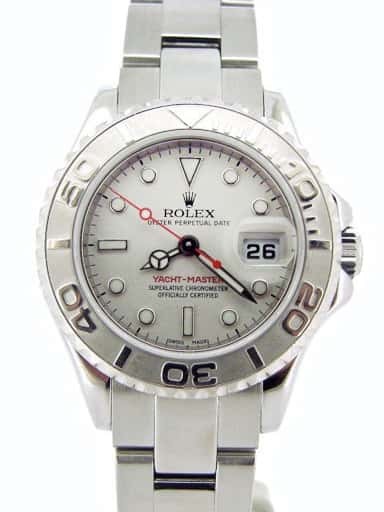 The dial of the ladies stainless steel and platinum Yacht-Master is also comparable to the mens models. Although done on a smaller scale, the womens Yacht-Master ref. 169622 also sports the “maxi style” dial with round lume plots, luminescent Mercedes-style hands, and a red lollipop seconds hand. In fact, the ladies Yacht-Master timepieces are the only womens Rolex watches to have a sporty dial like this. Identical to the mens model, the ladies Rolesium Yacht-Master is also presented on a stainless steel Oyster bracelet, albeit smaller. Again, there’s a contrast here where the center polished links are flanked by brushed finished links. Although the Rolesium Yacht-Master with the platinum dust dial is essentially one color (except for the red accents on the dial), Rolex plays with textures and shades to make the watch visually alluring. One of the most appealing benefits of a woman’s Rolex watch is that they run on automatic mechanical movements rather than the quartz movements typically found in ladies timepieces. Powering the ladies stainless steel and platinum Yacht-Master is the in-house Rolex Cal. 2235 self-winding movement. Like all modern-day Rolex watches, the Caliber 2235 is certified by COSC, hence the “Superlative Chronometer Officially Certified” designation on the dial. The womens Yacht-Master watches all come equipped with a quick-set instantaneous date function magnified by the Cyclops lens on the sapphire crystal. Since the ladies stainless steel and platinum Yacht-Master ref. 169622 is no longer in production, the only place to find them is in the secondary market. In fashion and beauty, womens products tend to be more expensive than mens items. However, this is not the case when it comes to luxury watches, particularly pre-owned Rolex watches. 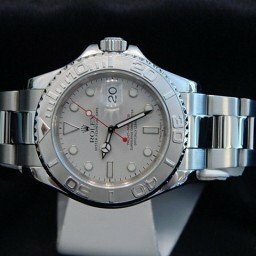 Depending on the model, condition, and year, pre-owned ladies stainless steel and platinum Yacht-Master watches range from $5,000 to about $7,000. Perhaps it’s time to get a head start on some holiday shopping! Take a look around to find the perfect his and hers watches with the ladies stainless steel and platinum Yacht-Master to match the one on your wrist.